In general, broken elbow or elbow fracture is the condition where there are some broken bones in your elbow joint. There are several types of broken elbow or elbow fracture itself. The most painless one called by nondisplaced. This is the condition where your elbow bones crack but still in place. The second one, more pain than the first one, called by displaced elbow. It happens when your end of broken elbow bones separated. The third condition is caused you more pain than the previous types. It called by comminuted. It happens when you accidentally broke your elbow bones into pieces. The last one is the most painful elbow fracture and may cause you a surgery. This is the condition when your broken bones go through your skin. Since this is a serious pain and both adult and children can experience this, it’s good for you to know broken elbow symptoms and how to treat the fracture. There are several signs of broken elbow that will be discussed in this article to give you more awareness to elbow fracture, so you will have chance to treat them to avoid an increasingly serious illness. Your elbows help you to throw, lift, swing or move things around you. But moving your elbows too hard can cause a pain and you won’t be able to do most of activities in your day. One of the reason why your elbows hurt is overuse. You move them more that they can handle the weight something you carry, or the way you swing them is more than the distance they can reach. Try to be wise when you want to move your elbow. Swelling of the elbow can immediately appear right after the accident happen. This is the condition when there is accumulation of fluid in tissues that can’t circulate well. It can occur through over the body or in a specific part only. A bruise itself caused when you hit yourself with something very hard that can cause your tiny blood vessels are damaged. Once you got a bruise, put an ice pack to reduce broken blood vessel and try to avoid using any heat water for showering, because it can cause more blood and swell. When you got the injury and it cause hurt in your elbows, you will feel difficult in moving your entire hand. You won’t be even flexible to move around. This is included in one of 4 fractured elbow symptoms. 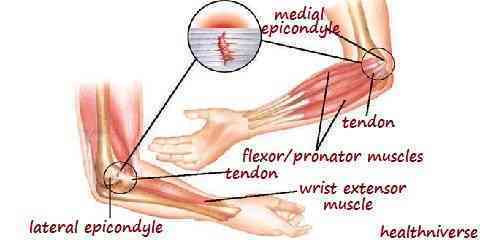 When you feel this kind of pain, try to relax your elbow and put them in rest. Don’t move them too much for a moment. Like what it says, having your elbow deform, is obvious. This is no longer a symptom that you can ignore. When this happens, severe damage has occurred to your elbow, and if this is allowed, it will cause a crack that will cause you a surgery. You better see a specialist doctor if it’s already happen to you. Injury that occurs in the elbow sometimes often underestimated by people. They keep doing their usual activities even they know their elbow get hurts and they feel pain. By not doing research of 4 signs of a fractured elbow, you won’t aware what should you do if you experience one of the symptoms. Do a wrong treatment will caused you a continuous pain. Broken Ankle Vs Sprained Ankle: What Are the Differences?